The last photo taken during my Walt Disney World vacation back in May. At 2:13PM EDT on May 30, 2012, I pressed the shutter on my Nikon D700 digital SLR camera to take this photo of the dragon waterfall in Disney’s Animal Kingdom. The mirror never flipped back up as it had done the previous 20,000 shutter presses. Luckily, it was my last day and I left for the airport two hours later. I had the camera sent to Nikon the next day and after six weeks and three days, Nikon returned my D700 all cleaned up like new and the mirror mechanism replaced. They even updated the firmware and replaced the memory card door which was an issue with the first D700s. After going through all the settings and tweaking them back to the pre-repaired state, I am back in business! I want to thank my friend, Doug, who lent me his D700 for three weeks easing my FX dSLR woes. I am thankful for getting reaquainted with my D70 which I will now use again under certain circumstances. Even if the upper LCD is broken. Lastly, I want to thank Nikon who first said they would not have the part to fix my camera until August 1st and then beating that deadline by over two weeks. 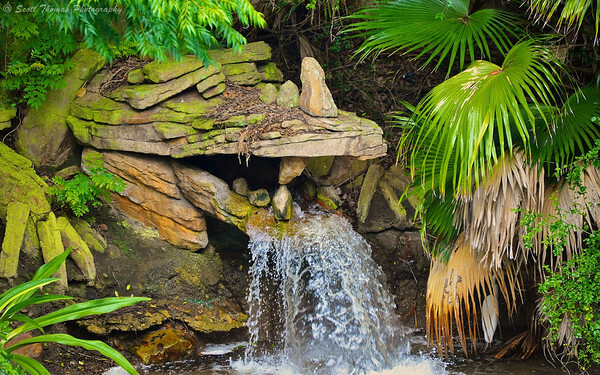 This entry was posted in Photography and tagged 28-300mm, disney's animal kingdom, dragon, florida, nikon D700, orlando, repair, rocks, stone, vr, walt disney world, water, waterfall. Bookmark the permalink. I love your title. Stoned dragon, Broken camera. It was so mesmerizing I leapt over to your blog to see what a “Stoned Dragon” might entail. As for the broken camera…sorry, Scott. I learned from you to be creative with my post titles. This one kind of flowed together. Do you find that you get more readership with the creative titles? It’s weird. It seems like we people have such a short attention span that we’ll only go to something which nudges us. Apparently–sigh–my post on manifesting guinea hens did not nudge too many over to my blog today. LOL–doesn’t matter–would use it again! Glad you survived your camera’s absence. Sometimes they do. There is not real magic formula I have found. I would say this one was a success as the WP.com graph climbed very high yesterday. Love the dragon water fall Scott. Glad the camera is fixed. Thank you, Sybil. The dragon waterfall is a bit out of place. Originally, the park was to have a land dedicated to mythical animals like dragons but was never realized. That’s great Scott, hopefully you won’t have that problem again, glad to be back blogging a bit. I have been so busy that it has been tough to get anything done except editing and shooting, people and portraits can sometimes take the fun out of photography. Thanks, Bernie! Glad to see you back in the blog-o-sphere when you can. Added you back to my blog roll, too.